Located 300km northwest of Kota Kinabalu, you find Layang Layang, part of the disputed Spratly Islands. The island is a true diver's paradise. Though the island is not cheap, it is definitely worth a visit. When you go to Layang Layang, do not expect to arrive at a tropical paradise. The place used to be an active marine base, and until only recent no public visitors where allowed on the 'man-made island'. Because of the splendid diving conditions, Layang Layang is a must-visit destination for scuba diving enthusiasts. There are no tropical beaches on the island; only the naval base, the resort and diving school and the air strip. The (only) resort on the island, Layang Layang Island Resort, is closed from September till February; as during this time the area is being plagued by the monsoon. It is situated 300km northwest of Kota Kinabalu in Sabah, Malaysia also known as 'The Jewels of the Borneo Banks'. Off the mystical island of Borneo lies a little gem, a sparkle within the deep blue sea. Like a mariner's dream, it stands all alone, a striking haven in the wide ocean waiting to be discovered. This is the intriguing island of Layang Layang, a coral-blessed, deep sea atoll off the coast of Sabah; a kaleidoscopic underwater world like no other. This marina heritage is a geographical wonder, with the atoll rising from the deep blue depth of 2,000mtr, hardly breaching the surface. Below you can see a map of Layang Layang Island. The actual island cannot be found that easy as it is a very small island within the Spratly group of islands. Besides; Google cannot show the Malaysian naval base on the island. With a distance over 300km from the nearest city (Kota Kinabalu), it is clear that flying – from Kota Kinabalu (KB) - is your best option to get to Layang Layang. This flight costs around $320 per person (including taxes). The flight to Layang Layang departs from terminal 1 at Kota Kinabalu Airport (BKI); you need to be at the terminal at least 1,5 hours before departure. There is an LLIR BKI office at the airport should you have any questions. The resort would prefer guests to reconfirm their flight when they arrive in Kota Kinabalu. Baggage allowance is 30kg per person (including hand luggage). There are numerous daily flights from cities throughout Malaysia to Kota Kinabalu; every domestic airline flies to KB. 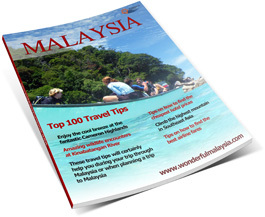 After a one hour flight you will arrive at one of the most beautiful diving areas in Malaysia. In addition to flying to the island, there are also a couple of liveaboards that visit the island; they sail from Kota Kinabalu. The only thing you can do at Layang Layang is eat, sleep and dive. No problems are encountered with getting a permit over here (unlike Sipadan where only a certain number of people are allowed to dive per day). Between the 1st of April and the 15th of May a surcharge (10%) is asked because of a big number of hammerhead sharks that swim around the island in that period. There is also a big chance of spotting whale sharks (always high on every diver's wish list). Layang Layang has splendid diving conditions; corals are in pristine condition. The waters are unspoilt and unpolluted; there are no fishing activities and almost no other disturbances. The PADI dive centre is headed by certified instructors with a team of qualified dive masters. Packages are available from $1,250 (twin) per person for a 6D/5N trip; this includes accommodation, meals and multiple dives per day.